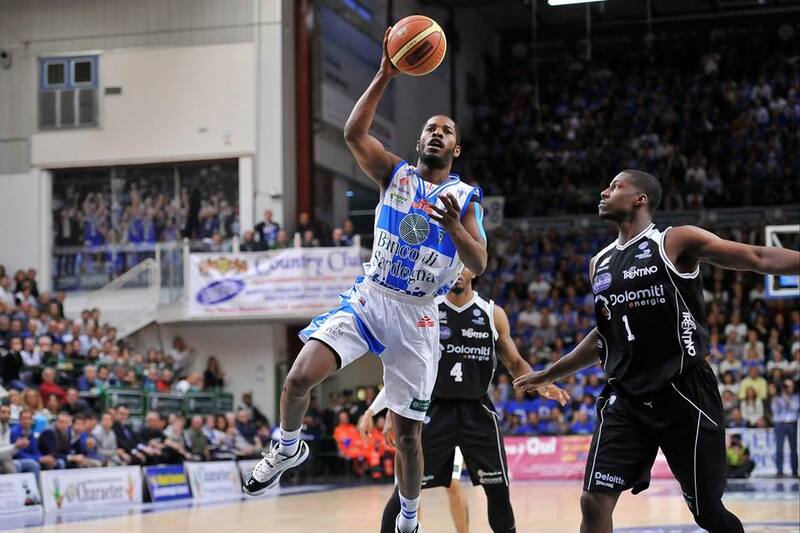 Jerome Dyson and #5 Dinamo Sassari have advanced to the Lega Basket Serie A semifinals upsetting #4 seed Trento 3-1. After dropping Game 1, Dyson and company rode a three game winning streak to keep their Championship hopes alive. Series MVP David Logan led the way for Dinamo, dropping 27 points in the Game 4 clincher. Dyson struggled to find his shot in the series but still found other ways to contribute, dishing out 6 assists in the final game. Following the Game 1 loss, let’s see how Dinamo responded to each key. Mitchell, a player who had caused problems for Dinamo in the past, was harassed into a woeful performance- managing only 29% from the field and commiting 7 TO per game- during the final three games of the series. Dinamo received the post-production they desperately lacked in previous battles with Trento, as forward Jeff Brooks provided extra strength inside to complement center Shane Lawal. However, the most impressive statistic of the series is the 68% Dinamo shot from the field in the final three games, including a 103 point explosion in Game 3. When you shoot the ball at such a high mark, it becomes almost impossible to lose. Here is a look ahead at Dinamo’s semifinal matchup. Dinamo has reached its third semifinals in only five years of Serie A play, drawing a matchup with #1 seeded Milan- fresh off a 3-0 sweep of #8 Granarolo. The clubs split the season series 2-2, though Dinamo came out victorious in the most important games, defeating Milan in both the Italian SuperCup at the beginning of the year as well as the Italian Cup in February. It comes as no surprise that the winner of this series is the favorite to take the Serie A crown. Below is an inside look at the Italian Cup Finals matchup in February to give some perspective on the history of these two clubs. This star-studded matchup features numerous former NBA players on the Milano side including MarShon Brooks (LA Lakers), Linas Kleiza (Toronto Raptors), Alessandro Gentile (Minnesota Timberwolves) and Samardo Samuels (Cleveland Cavaliers). Though Milano is favored and equipped with a deep bench, Dinamo possesses both the athleticism and momentum to eliminate the #1 seed for the third time this season. Here is a look at the probable starters for each team. The series tips off tomorrow with two games in Milan before returning to Sassari on June 2nd for the final two games. Television information is unavailable at the time but the games should be available by following Lega Basket Serie A on the Twitter app Periscope. Best of luck to Sassari in their quest for a third trophy! This Post was posted in FIBA Europe, Lega Basket A, UCONN Abroad and tagged Basketball, David Logan, Dinamo Sassari, Edgar Sosa, Emporio Armani, Euro Hoops, FIBA Europe, Forza Dinamo, IMieiPlayoff, Italy, Jerome Dyson, Lega Basket A, Linas Kleiza, MarShon Brooks, Milano, Samardo Samuels. Bookmark the permalink.